You would think turmeric capsules would be all the same wouldn't you. Well that is not true. The person who brought you Prosoria and NUVOTHERA told me personally that he tried over 45 different kinds of turmeric supplements and couldn't find anything to his liking so he decided to make one. Yes. He is a biochemist and can do those sorts of things. Mr. Clapp, the man behind the brands above, spoke with me over the phone and gave me so much information. I am afraid I will not be able to relay it all so well. First of all, NUVOTHERA is super-micronized because it is has to be small enough for the molecule to absorb into the body. Second, it is full of turmeric cucumin because that is the heart of the antioxidant that has the goodies, the free radical fighting molecules and joint benefits are in the smaller molecules. 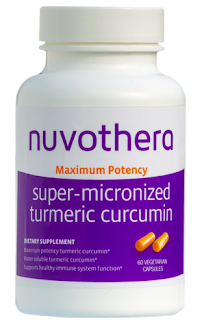 Curcumin is the part of Turmeric that has the effectiveness available for turmeric. Here are all of the benefits that turmeric supposedly helps: joints, muscles, healthy skin and healthy hair, healthy heart and digestion, memory & mood, immune system. and inflammatory response. Because of the following, you are getting the maximum allowable absorption by law, maximum potency, whole Turmeric Root and Curcumin, no chemical absorption enhancers, clinically tested ingredients, highest quality cGMP certified, free shipping and 30-Day guarantee.This product is 100 times more potent than other leading curcumin products. It doesn't need absorption enhancers, which are ingredients to enhance its absorption rate. It absorbs all on its own. This kind of turmeric is water soluble and that means that it absorbs quickly into the body. I tried it for over a month and noticed that my arthritis quickly abated. After about 2-3 weeks I noticed a significant decrease in my knee pain. And this is pain I have had for months. NUVOTHERA definitely made a significant difference in my pain. It also has the difference to make on your skin and hair. I did notice that after I quit taking all of my hair vitamins my skin and hair still glowed. NUVOTHERA comes in a 60 capsule bottle for $39.95 on www.nuvothera.com. It will eventually be available in other markets but currently it is only available here.